On Sunday March 11, 2012 at 1 pm at the Scottsdale Harkins Shea Cinema 14 theaters, film poducers Lynne D. Kitei, M.D. and Steve Lantz will be presenting their Internationally award-winning film entitled, " The Phoenix Lights - We Are Not Alone." UFO enthusiasts and experts call the Phoenix Lights the most widely documented and still unexplained mass sighting ever recorded in human history. The film is an in-depth examination of the mile-wide, V-shaped light formations and craft witnessed by thousands of people in Phoenix and throughout Arizona on March 13th 1997. The film is being screened in Scottsdale for the 15th anniversary celebration of the historic, yet still unexplained mass UFO sightings over Arizona. This is an excellent documentary.﻿ Probably the only serious one that has ever been made on the Phoenix Lights events. It is a very courageous piece of work. The witnesses that chose come forward, knowing that they would be ridiculed by so many for their beliefs, all of them are individuals to be respected. The unfortunate thing is that their credibility has been constantly shot down by debunkers, skeptics, and the military. Even skeptics have to find it a stretch to expect everyone is willing to believe that over 3,500 military and commercial pilots were all hallucinating when they reported UFOs? 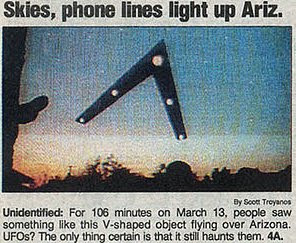 Also were the more than 10,000 witnesses just massively hallucinating when they simultaneously witnessed the famous V-shaped object over Phoenix? It does not seem likely. Not only did people try to capture the phenomena on﻿ film, but because it blacked out the sky, the pics didn't turn out. In the Documentary the 911 Phoenix Police operator herself states that police helicopters were sent up to investigate. 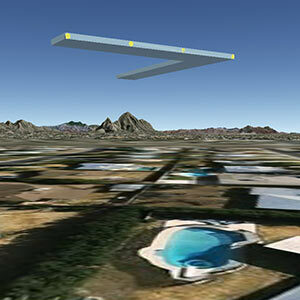 There is also a report to NUFOC (National UFO Reporting Center) that military jets were deployed to intercept the mile wide craft right over 7th ave and Indian School Road, and when they got close, the phenomena blinked out of sight. Many of the eye witnesses to the Phoenix Lights were prominent citizens and very reliable people. There were pilots, doctors, politicians, police officers, firemen, local business owners, street sightings, adults, children, and thousands of other citizens who all witnessed this event.﻿ There is no doubt it was something quite real thing. It may have been an experiemental aircraft, something from alien regions, but there were definately unidentified flying objects that were seen, recorded, video taped, and by multiple observers in several states. That is a whole lot of witnesses. Dr. Lynne﻿ Kitei, is the Phoenix Lights key witness and executive producer of this documentary. She is said to have remained reclusive and anonymous during the 7 years spent on her own investigations of the 1997 events. This was before she came forward in 2004. Her time in anonymity was spent writing her comprehensive book on the Phoenix Lights and the editing of this internationally award winning film. For many this is the documentary of a lifetime. It is a must see for enthusiasts, witnesses, Phoenix residents, and anyone who wants more information. For complete behind-the-scenes info on the making of the documentary, visit the official website. The gala screening of the documentary will also include opportunities to meet the cast, see a presentation by Former Councilwoman and Vice Mayor Frances Barwood with the Navajo Rangers, there will be a question and answer forum, and a book signing. The movie screening will be at the Harkins Shea 14 at 7354 East Shea Boulevard in Scottsdale, AZ 85260. These special events have been sold out in past years, so it is best to get tickets early via the Harkins website or call (480) 948-6555 for further details. Those interested in more of Lynne D. Kitei's works can find the following links informative and useful. To purchase her book "The Phoenix Lights...A Skeptic's Discovery That We Are Not Alone" book by key witness, Lynne D. Kitei, M.D., that was released on March of 2010. 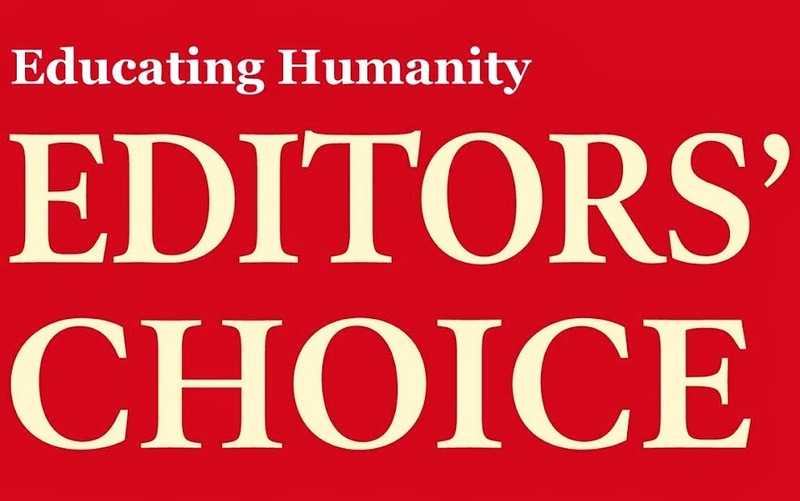 Or to purchase copies of "The Phoenix Lights" Documentary, produced by Lynne D. Kitei, M.D. in collaboration with Steve Lantz Productions. Go to the links provided to their individual webpages on Amazon.com. Also all detailed and updated information about these events, can be found on the Phoenix Lights Network website and Facebook page. On the website it describes itself as the, "...comprehensive website concerning the historic and still unexplained Arizona UFO sighting of March 13, 1997, called the Phoenix Lights. Filled with TV News reports, photos, footage, live radio interviews, Geospatial Animations, Communication Art, Debunking the Debunkers, and more!" On the Phoenix Lights Network Facebook page, it describes the group mission as an attempt, "To inform and enlighten the public concerning the most important and most documented anomalous mass sighting in modern history. Besides posting similar sightings and updates, the Phoenx Lights Network FB page gives a voice to those who have experienced similar phenomena and are asking, Are we alone in the Universe?" 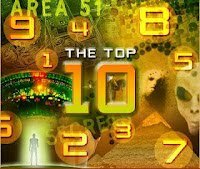 To many this is the most historic anniversary of any UFO related event, especially being in the year 2012 meaning something more significant. Either way, Arizona and Phoenix residents will be sharing a communion of sorts. They share a common experience, memories, a vision, a search for truth, and the anniversary marks that none of them are alone. Many remember the Phoenix Lights and their memories are long.